SPG Gold today? You will NOT be getting Platinum after August 1st. Regardless of the various arguments on whether SPG Golds were ever really "entitled" to Marriott Gold benefits, etc., etc... one thing is clear: SPG Golds will be losing a benefit mid-year, which is guaranteed 4 pm checkout. Since our announcement last month, we’ve been listening to member feedback and have a few updates and clarifications to share. Based on member response, we’re adding more flexibility for Lifetime Platinum Premier qualification. Now, SPG and Rewards members who achieve 750 nights and 10 years of Platinum status by December 31, 2018 will be grandfathered into that Lifetime tier, which starting in 2019 will no longer be available to earn. Rewards members can also qualify under the current criteria (750 nights + 2M points) through year end. As we shared previously, members can also qualify for all other Lifetime tiers through both the new criteria on an ongoing basis and under the current criteria through December 31, 2018. And remember, we’ll combine lifetime activity across both Rewards and SPG toward qualification when members combine accounts in August. We’ve also received some questions regarding status in the new program for members who status matched to receive elite in both SPG and Rewards. In August, nights earned (vs. linked status) will determine Elite status in the new program. 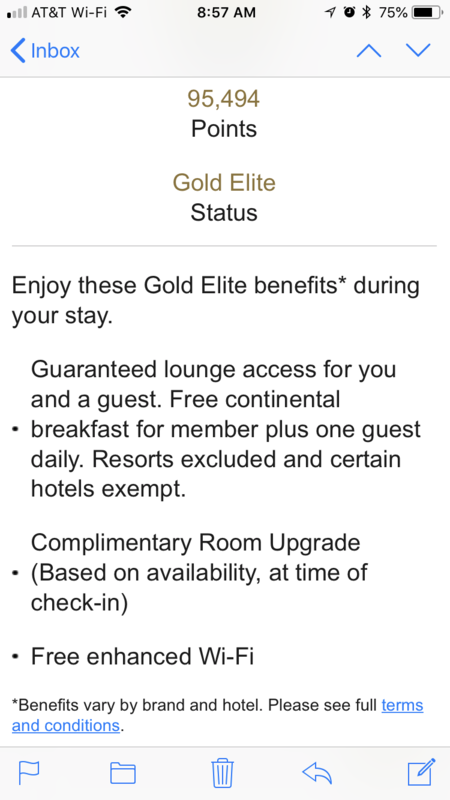 For example, a SPG Gold member (10 stays/25 nights) who status matched to Rewards Gold Elite (50 nights) will be mapped to Gold Elite (25 nights) in the new program, whereas a Rewards Gold Elite (50 nights) will be mapped to Platinum Elite (50 nights). The below FAQs hopefully provide even more detail, and have now been added to members.marriott.com. Please be sure to let us know what other questions we can help answer. Yes, in addition to earning based on the new criteria, members can earn Lifetime Elite Status under the legacy requirements through the end of 2018. If Lifetime status is achieved by legacy requirements, between August and December 31, 2018 you will receive notice of your updated Lifetime Elite status in January 2019. If Lifetime status is achieved based on the new criteria, you will be notified both in August 2018 as well as any time it is achieved through the end of the year. If I will not be grandfathered into Lifetime Platinum Premier Elite, will I have the ability to earn into this level in 2018? Yes, members can earn Lifetime Platinum Premier Elite in 2018 if they achieve 750 Lifetime nights and 10 years at Platinum Elite status. This requirement is only for 2018 and will not be continued in future years. Members will receive notice of this Lifetime achievement in January 2019. I already linked my SPG and Rewards accounts. What will happen to my matched elite status in August? Answer: I'm told "No" –if you have the card and get Gold today…you will be mapped to the NEW Gold tier. So, if you have the AMEX Plat/Centurion card that gives you Gold today…you’ll still get Gold status – just with the newly-defined post August 2018 benefits. "Enjoy these Gold Benefits* during your stay. Guaranteed lounge access for you and a guest. Free continental breakfast for member plus one guest daily." *Benefits vary by brand and hotel. Please see full terms and conditions." No mention of changes come Aug 1.
my confirmation email never show "enjoy these (tier) benefit ++++"
Just did another post August refundable booking and it appeared. It's towards the bottom of the email confirmation under the heading of "Your Rewards Information", just below the "Rate Details and Cancellation Policy" heading. Just curious, did it list the current (legacy) benefits or the new program benefits? Current (legacy) benefits listed for an October reservation made today. A guest who checks into a hotel after the shift to the new program will staying under the new benefits and with the new status. Had it ever been otherwise, everyone losing status would have furiously made reservations for the next year so as to keep unearned perks and status. To get perks, a guest with the requisite status needs to be staying in the room. If a guest was Plat at the time of the reservation but is Gold at check-in, no Plat guest will be staying in the room to fulfill that requirement. Wording on the reservation is clearly based on current status and is not intended to guaranty these benefits are available even if the status drops. The assumption is members are mature and honest enough to act in a business-like manner and not try to gain unearned perks through a silly argument. That giant asterisk on the email instructing one to check the terms and conditions allows Marriott to change the benefits and any time and expressly states there is no contract guaranteeing any benefits. The wording on the reservation is clumsy. If anyone questions if the hotel will honor the lost perks, reach out to the hotel ahead of time. IME, most hotels will give you the perks, especially non-US properties and more likely closer to the date things change, but the attitude that anyone is entitled to the benefits because of Marriott's bad wording is an attempt to take advantage. Now if they just cut over to one program, as they do have the ability to do, I'd agree with your assessment. 1) What if the guest hasn't merged their accounts to create the MPG account? Shouldn't they lose all status benefits in that case? 2) They have said we have until 12/31 to earn status according to the legacy rules, shouldn't benefits follow suit? Effectively they have chosen to have three different programs and need to extend legacy benefits through 12/31, if one chooses to not merge accounts. 3) If the confirmation states they have certain benefits wouldn't it be reasonable to expect those benefits? Yes, every property has the ability to go above and beyond the minimum. What I take exception to is when they say they will grant what we've booked as "a one-time exception". Personally, I've had so many "one-time exceptions" to fill a lifetime! You are confusing what happens in August with what happens when accounts are merged. Note it does not say you get a new status when you combine your accounts. It does not say that anywhere. The new status happens in Aug. Period. Keeping tabs on the old qualification parameters, which is happening, is different than having a new status in the new program. Hotels are not going to have different sets of perks for different programs. If you do merge your accounts or not you will have the new level on the conversion chart. The materials are clear. It's not like someone who is Gold can avoid the downgrade by just not merging accounts. In Aug you will have your new status under the new program and get the benefits associated with that even if you have not combined your accounts. That is the purpose of the conversion charts. That's the whole argument about Gold benefits changing mid-year. Which is why I have never understood the common advice on here, which Marriott has never stated... Combining your accounts will not mean you cannot qualify for LTPP under the old parameters. Marriott has made it clear that count will continue whether accounts are combined or not. Combining will allow you to possibly bump up status for 2019, which should become effective immediately like in the past. If someone has YTD 40 Marriott nights and 40 SPG nights on the day the new program counts, both the MR and SPG levels will translate to Gold in the new program. Without combining, the member can use either number and will be Gold in the new program and will be treated as such. If the member combines the accounts the member will have 80 nights and will become Plat 75 in the new program, so it makes sense to combine quickly. The member will not magically keep Plat in the new SPG program and get those benefits as hotels will no longer be looking at that or offering benefits based on that. And the email does not guaranty future benefits. The member gets the gold benefits in effect during the stay if the member is still Gold. That is included in the T&Cs which are specifically incorporated in the email. Note it does not say you get a new status when you link your accounts. It does not say that anywhere. The new status happens in Aug. Period. Keeping tabs on the old qualification parameters, which is happening, is different than having a new status in the new program. Hotels are not going to have different sets of perks for different programs. If you do link your accounts or not you will have the new level on the conversion chart. The materials are clear. It's not like someone who is Gold can avoid the downgrade by just not linking accounts. In Aug you will have your new status under the new program and get the benefits associated with that even if you have not linked your accounts. That is the purpose of the conversion charts. That's the whole argument about Gold benefits changing mid-year. Which is why I have never understood the common advice on here, which Marriott has never stated... Linking your accounts will not mean you cannot qualify for LTPP under the old parameters. Marriott has made it clear that count will continue whether accounts are linked or not. Linking will allow you to possibly bump up status for 2019, which should become effective immediately like in the past. If someone has YTD 40 Marriott nights and 40 SPG nights on the day the new program counts, both the MR and SPG levels will translate to Gold in the new program. Without linking the member can use either number and will be Gold in the new program and will be treated as such. If the member combines the accounts the member will have 80 nights and will become Plat 75 in the new program, so it makes sense to combine quickly. The member will not magically keep Plat in the new SPG program and get those benefits as hotels will no longer be looking at that or offering benefits based on that. Yes, still lots of open issue. Linking only applies to legacy account to legacy account. They have toggled on whether your linked status to MR, for example, will get you new program status. Last I saw as Yes. They have not elaborated on what happens when you merge your accounts. I don't trust them to keep all three accounts open or track your progress as though all three are open. That's why my advise for caution before doing the merge. Let's see what the details/ramifications are first. Sounds like a safe way to go. Immediately after posting I realized the word linking was wrong and changed all those references to merge or combine. Sorry about that. While I agree caution is always best and Marriott has always had bad IT, it is clear tier and benefits change when the program changes and not based on when accounts are merged. Nowhere does Marriott claim the changes happen when someone merges accounts and all references state clearly new status starts in Aug, new benefits start in Aug. They have consistently said you may qualify for a higher status when you merge accounts, so if someone will qualify for a higher level they should merge quickly. They have clearly said SPG Gold becomes new program Gold in Aug, not upon merger at a later day. They have clearly said the new program starts in Aug, there will be midyear changes and have never said they would be running four separate programs until the end of the year. You can still qualify for LT status under the old rules until the end of the year, but there has been nothing coming from Marriott that would indicate the old programs would otherwise be running. Everything indicates the new program starts in Aug and other than LT qualification parameters the old programs end. They have toggled on whether your linked status to MR, for example, will get you new program status. Last I saw as Yes. This was clarified a week ago. The marketing materials were updated. Linked status does not matter in the new program qualification. Status is based on level achieved in the primary program. So an SPG Gold who linked to Marriott Gold will be Gold in the new program. not Plat 50 like those who qualified on the Marriott side for MR Gold. Elite tier will be based on the status earned, not status granted via linking and status matching. See chart below for August status. And note again the reference is to status in Aug, not when accounts are merged. I agree, but being conservative here, I would still advise--based on what has currently been verified about the new combined program--that anyone hoping/planning to get LTPP or any lifetime status based on current SPG rules (or current MR rules) should avoid merging accounts until either the new lifetime status posts or until we are assured that one can merge accounts and still qualify for the particular status (LTPP might be treated differently here, for example, or indeed any lifetime status level) after accounts are merged. In my case, I'm SPG LTP and MR LTP and I have over 100 Marriott nights this year. I would not expect to instantly become SPG Ambassador when I merge accounts, nor would I expect to be able to use Your24 until my $20,000 spend posts. While I agree that given Marriott'a terrible IT history waiting to merge under those circumstances is likely the right course, it won't change the fact that when the new program starts in Aug we will all have our new status, per the chart, whether we have merged or not and we will all be under the new program's rules. Marriott will not be running different programs depending on whether accounts have been merged and nobody will keep old benefits by not merging. All the materials released make this clear. The new program parameters start in Aug, not when you decide to merge accounts. I'm not predicting different programs or different benefits, just saying that if one wants to qualify for any status based on rules (SPG or MR) from the existing legacy SPG and MR programs, I would be extremely cautious about merging the accounts first. YMMV, but we haven't yet seen any statement of the benefits to us that will come when accounts are merged and be withheld unless/until the person decides to actually take the step of merging the accounts. Assuming that the merging of accounts will be optional in the interim, I wouldn't rush to blindly merge accounts without first understanding the consequences of doing so. Again, YMMV and good luck everyone. "First of all , do not worry about your status. After August you will be Platinum level under new program and keep your all benefits of Gold level now. So you will definitely enjoy your stay in January with lounge access and late check out etc…. Regarding to valid 31, December 2018 this topic mention about life time member. I already checked Marriott Customer Care center and found that you are not life time member so don't worry about it." @Eskimoboy, even if the hotel is wrong, IME the hotel will honor your email and not penalize you for their mistake. Is there a risk? Yes, but it seems pretty low.